Everyone goes through times in their life where they feel lonely. Whether you move to a new place or go through a breakup it’s easy to feel isolated. If you’re dealing with depression and anxiety on top of that it can get really overwhelming. I’ve gone through tons of transitions in my life where I felt completely alone. 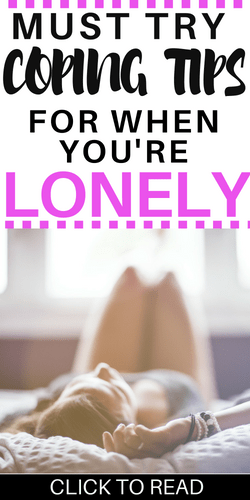 Here are my tips for feeling less lonely. If you’re going through a breakup be sure to listen to my podcast episode below and subscribe for future mental health podcast episodes. Admitting that your lonely can make you feel really vulnerable but if you don’t admit that you need help nothing will change. Let your friends and family know how you’re feeling and ask to make plans with them. If you’ve lost touch with old friends reach out to them and see if you can reconnect with them. If you don’t have anyone you want to reconnect with then make an effort to meet new people. Use meetup.com or sign up for some sort of class where you can meet new people. If you’re struggling with your mental health check out my episode on asking for help. I also have a Mental Health Support Group full of amazing women that you can join on Facebook. This is a great community to vent to or connect with if you are struggling with your mental health or feeling depressed. If loneliness is feeding your depression reach out and get help. 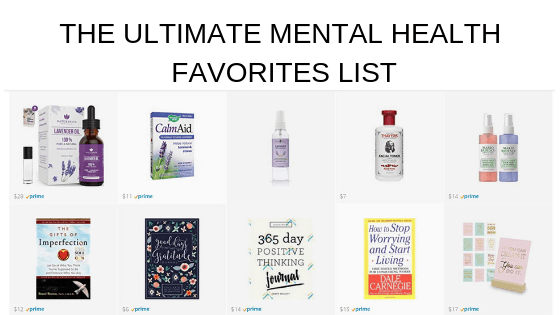 I use BetterHelp to get therapy online and I recommend trying it if you’re really struggling. If you feel depressed there are professionals that can help you, don’t wait to get help. My biggest regret is that I waited so long to find a therapist and get help for my depression. I spent years waiting for it to get better and pretending I was fine. Not only did I waste years of my life needlessly suffering I also missed out on tons of opportunities and relationships. I currently use BetterHelp to get therapy and I recommend it if you are interested in talking to a certified therapist over video chat, phone call or email. If you haven’t been to therapy before check out my post on going to therapy for the first time. Rescuing my dog Charlie was the best thing I ever did for myself. I got him during the most difficult time of my life. My close friend had just passed away and I was depressed AF. Charlie has been a huge comfort to me over the last two and a half years I’ve had him. He makes living alone way less lonely and I’m always happy to come home and see him or to spend time hanging out with him at home. You have to make sure that you are able to take care of the pet that you get but it is definitely worth it. If you’re really struggling with loneliness a pet can be a huge source of emotional support. If you can’t have a dog think about getting a cat or even a guinea pig. Having an animal around can be really comforting if you are feeling lonely. Work on reframing your mind and to try and make your situation into a positive. After I broke up with my boyfriend I was really lonely but I decided to use the time as an opportunity to work on myself. I listened to personal development books at night and signed up for dance classes after work. Being lonely is a difficult feeling but if you can focus on using the extra time to work on your personal development or try something new. Learn how to cook really incredible food or signup to run a marathon. If you can start to see your alone time as a blessing it can help alleviate some of the loneliness. Shift your state of mind and look at your time alone as an opportunity to do the things that you want to do. If you’re feeling lonely find a cause to get involved in. Getting involved with something in your community can help make you feel connected to other people. Find an organization that you think does really important work and find out if they have a volunteer program you can join. I used to volunteer at Habitat for Humanity and it was a great way to have something meaningful to go do on the weekend. Volunteering can give you a purpose and a reason to get out of the house. I started this blog at a super low time of my life. My 9-5 job was grinding me down and I had just broke up with my boyfriend after the holidays. I felt like I needed a project or something to focus on. I decided to start Radical Transformation Project to share my experiences with depression and anxiety. This blog has been a HUGE blessing in my life. I feel like my life and experiences have a purpose and being able to help other people means the world to me. Having a project to work on can be a great distraction and give you a meaningful way to spend your time. Usually, if you’re feeling lonely you are probably feeling pretty crappy overall. This is the perfect time to start getting fit and focus on your physical fitness. Not only will you be getting healthier overall but you will be getting a nice shot of endorphins in your brain. I lost one of my best friends a few years ago and I started running twice a day after her death. Running was one of the only things I knew I could count on to make myself feel better in that dark time. I knew if I ran long enough eventually I would get some relief from the sadness and loneliness I felt. I always turn to physical exercise to help me feel better when I’m emotionally struggling. In addition to exercising changing your diet can have a huge impact on your quality of life. I try to eat at least one big salad a day and avoid junk food throughout the day. Make a commitment to eating foods that make your body feel good and start avoiding food that you know is harmful to your body. Keeping a journal can be a great way to sort out all of your emotions when you’re going through a difficult time. If I’m going through a hard time and feeling crappy I’ll write in my journal 3-5 times per day. If you need some journal prompts go check out my post here. I also like to make gratitude lists in my journal. I find that the more I make my brain focus on positive things the better I feel and the more I notice good things throughout the day. If you’re feeling lonely I think this is the perfect time to start keeping a journal.